Gorillaz is a musical project created in 1998 by British musician Damon Albarn and British cartoonist Jamie Hewlett. This project consists of the Gorillaz music itself and an extensive fictional universe depicting a "virtual band" of cartoon characters. 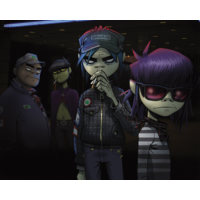 This band is composed of four animated members: 2D (lead vocalist, keyboard), Murdoc Niccals (bass guitar), Noodle (guitar, keyboard, and occasional vocals) and Russel Hobbs (drums and percussion). Their fictional universe is explored through the band's website and music videos, as well as a number of other media. The music is a collaboration between various musicians, Albarn being the only permanent musical contributor. Their style is a composition of multiple musical genres, with a large number of influences including: dub, hip hop, alternative rock, electronic and pop music. The band's 2001 debut album Gorillaz sold over seven million copies and earned them an entry in the Guinness Book of World Records as the Most Successful Virtual Band. It was nominated for the Mercury Prize 2001, but the nomination was later withdrawn at the band's request. Their second studio album, Demon Days, released in 2005, went five times platinum in the UK,double platinum in the United States, earned five Grammy Award nominations for 2006 and won one of them in the Best Pop Collaboration with Vocals category. Gorillaz have also released two B-sides compilations and a remix album. The combined sales of Gorillaz and Demon Days had, by 2007, exceeded 20 million albums. The band's third studio album, Plastic Beach, was released in 2010. Their newest album, The Fall, was released on 25 December 2010.